Pope Francis stressed this during his Mass today in Molfetto, during his visit there and to another southern Italian town of Alessano, also in Puglia, to commemorate the 25th anniversary of the death of the popular Italian bishop Don Tonino Bello, remembered for his helping the poor, disadvantaged, and promoting peace. In 2007, the cause for beatification of Don Tonino, late bishop of Molfetta-Ruvo-Giovinazzo-Terlizzi, was opened. At around 11 a.m., Pope Francis’ helicopter, which had departed from Alessano, landed in the Piazza Cala Sant’Andrea, next to the Cathedral. The Pope transferred by car to the port of Molfetta, where he greeted the faithful at the docks, arriving at the stage set up for the Eucharistic celebration. 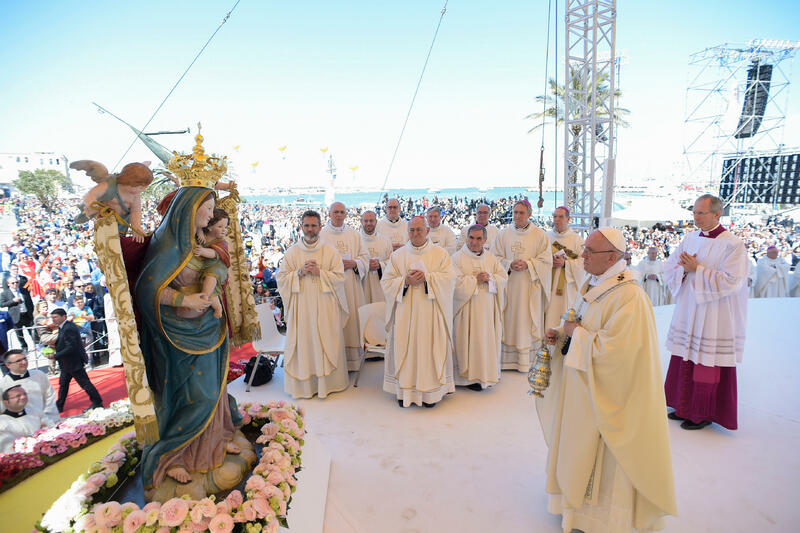 In the port of Molfetta, the Holy Father presided over Mass. The readings presented two elements central to the Christian life: the Bread and the Word. Asking what does it mean?, the Pope observed that for our life, it is essential to enter into a vital, personal relationship with Him. Jesus in the Gospel, the Jesuit Pontiff stressed, adds: “He who eats me will live for me.” Francis stressed that this involves stopping living for himself, for his own success, to have something or to become someone, but he lives for Jesus and like Jesus, that is for others. The Holy Father reminded that the Bread of life, the broken Bread, is also Bread of peace. Don Tonino claimed that “peace does not come when one takes only his bread and goes to eat it on his own. […] Peace is something more: it is conviviality.” We who share this Bread of unity and peace, the Pope said, are called to love every face, to mend every tear; to be, always and everywhere, builders of peace. Together with Bread, Francis said there is the Word. Many, the Pope noted, did not understand that the Word of Jesus is to walk in life, not to sit and talk about what is good and what is not. Don Tonino, precisely at Easter, wished to welcome this new life, finally passing from words to deeds. Christian life, the Pope stressed, must be invested for Jesus and spent for others. After the Mass, Pope Francis departed in his helicopter from Molfetta and returned to Rome.